Beas: Vedic name: Aarijika; Sanskrit name: Bipasha. The river rises from the Beaskund in the Pir Panjal range near the Rohtang Pass. The Beas runs for about 260 km in Himachal Pradesh before entering Punjab at Murthal. The tributaries that form River Beas are Parbati, Spin, Hurla, Malna, Chakki, Sainj, Uhl, Phung, Binwa, Banganga and Mankhad. Thanks to its snow-fed tributaries, water levels of this river increases greatly during the monsoons, sometimes resulting in floods. Pandoh Dam and Pong Dam are the major dams built on River Beas. Chenab: Vedic name: Askini. Popularly known as Chandra Bhaga, the River Chenab originates from Tandi in Lahul Spiti where two rivulets namely Chandra and Bhaga meet to form this river. It is the largest river of the state in terms of the density of water. It flows for 122 km in the state before leaving it at Sansari Nullah and then entering Kashmir. The river runs through barren land where there is no human settlement. Ravi: Vedic name: Parushini; Sanskrit name: Irawati. Ravi River originates at Bara Bangal of Kangra district, and flows through Bara Bansu, Tretha, Chanota and Ulhansa. It covers a distance of 158 km in Himachal Pradesh before entering Punjab state. Its famous tributaries are Budhil, siul, Baljeri, Chatrari and Baira. Barmaur, Madhopur and Chamba towns are situated on the banks of the river. Satluj: Vedic name: Shutudri; Sanskrit name: Sathdru. It rises from Mansrovar Lake in Tibet. It enters at Shipki in Kinnaur district of Himachal. Sutlej flows through Shimla, Bilaspur before exiting from Bhakra village to enter into Punjab. The world’s largest dam, Bhakhra Dam, has been constructed on Sutlej River. Yamuna: Vedic name: Kalindi. It rises from Yamnotri in Uttar Kashi, Uttarakhand and enters Himachal at Khadar Majri in Sirmaur district. Yamuna’s main tributaries are the Tons, Giri, Pabbar and Bata. The river itself is the largest tributary of the Ganga. The catchment area of Yamuna in Himachal is 2320sq.km. 1. How many major rivers flow through Himachal Pradesh ? 2. Which among the following rivers flows through Himachal Pradesh? 3. What is the vedic name of the river Ravi? 4. What is the total distance covered by river Satluj in Himachal Pradesh? 5. Which river covers the longest distance in Himachal Pradesh? 6. 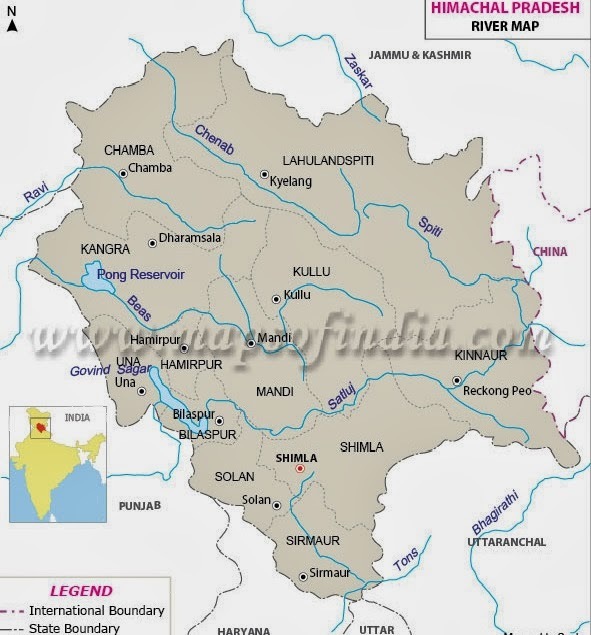 Which river enters into Jammu & Kashmir from Himachal Pradesh? 8. Which river covers the shortest distance in Himachal Pradesh? 9. What is the vedic name of the river Satluj? 12. Which river in Himachal have highest volume of water flow? 13. Chandra and Bhaga are the major tributaries of ________ river. 14. At which place Chandra and Bhaga meet to form Chenab? 15. According to Hindu mythology, Yamuna river is concerned to _______ God. 16. Which river originates from Uttrakhand? 18. At which place Satluj enters in Himachal from Tibet? 20. Which river is also known as “Vipasha”? Where does the river satluj enter shimla district?